Ballast - Tortoise frame - 580P Copper Polycarbonate Lens £179.00 Sale Price £159.00 LAST PAIR! You know that feeling you get when you’ve been wearing sunglasses all day? Well, forget it. This member of our super-light frameless collection weighs in at a feathery 16 grams. But lightweight doesn’t mean fragile. TR90 nylon and polarized polycarbonate lenses make the Ballast as durable as it is comfortable. Top it all off with Costa’s COSTA® 400 lenses, and you’ve got a pair of glasses that’s at home in, on and around the water. Blue Mirror Harsh sun, natural contrast - Offshore fishing, harsh light. Green Mirror Bright sun, high contrast - High contrast, sight fishing in full sun. Silver Mirror Versatile, cloudy days - Excellent for sight fishing, most versatile. Grey Everyday natural contrast - All round activities, natural contrast. 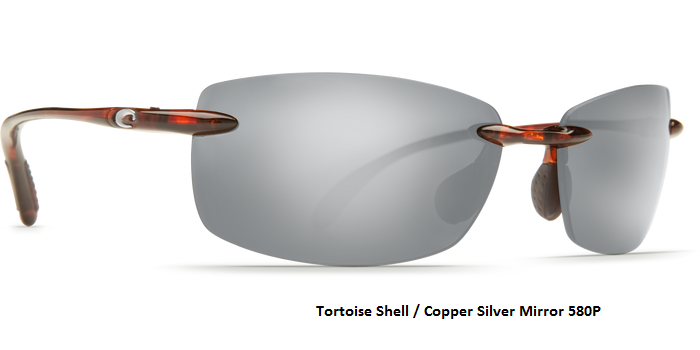 Copper Driving and variable light - Sight fishing in variable light, driving.